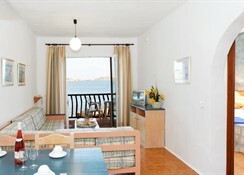 Tramontana Park is a wonderful complex located in the lively area of Playa De Fornells, Menorca. This 3 star complex is 600 metres from the beach and offers direct access to the beach in this seafront location. The apartments overlook the Cala Tirant Bay north of the island. Tramontana Park offers a range of facilities combined with spacious comfortable accommodation. This complex were built in 1994 and comprises of 86 one, two and three bedroom apartments. Tramontana Park offers a great location ideal for couples and all the family looking for a relaxing holiday. 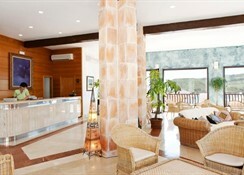 Getting to the hotel: Tramontana park is located 30 km from Menorca Airport. Local tips: Fornells fishing village is located 4 km away and the capital of Mahon is 29 km from the complex. Food, drink and entertainment: There is an air conditioned buffet style restaurant that serves national, international and vegetarian dishes. There is also a snack bar that serves snacks and refreshments all day. 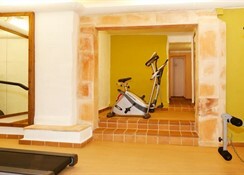 Sports, games and activities: Outdoor swimming pool, on-site gym and table tennis. For the kids: Children's playground. Additional: 24 reception, currency exchange, Wi-Fi in reception (payable locally), luggage storage, medical services, sun loungers, parasols, air conditioning, laundry service and parking. The Aparthotel Tramontana Park is made up of 86 apartments; 1 bedroom, 2 bedrooms and 3 bedrooms All apartments feature bathroom, fan, satellite TV, telephone, terrace and have a sea view. My family and I stayed at Tramontana Park from 18th - 25th July 2018 and enjoyed our stay primarily due to the hotel's location and views, which allowed us to watch the sun set behind the mountains each evening. We had a choice of two coves within a few minute's walking distance and the beach was about a 15-20 min walk away. The sea was clean and very still most of the time which made it great for an introduction to snorkelling for my 8 and 6 year old who, when we were on the beach, had to wade for some distance before the water became deep. The hotel and surrounding properties are beautifully maintained and very picturesque in La Fornells and of course, the weather was beautiful. The staff were helpful and friendly and the rooms kept clean. With only one swimming pool on the premises, it did get crowded at times and whilst the food was very enjoyable, meals were a little repetitive but overall I would recommend a stay at Tramontana Park.